The PUC initiated a "rulemaking" process Thursday that would include a new requirement forcing suppliers to disclose the actual price per kilowatt hour they charge, including the effect of any additional fees imposed. 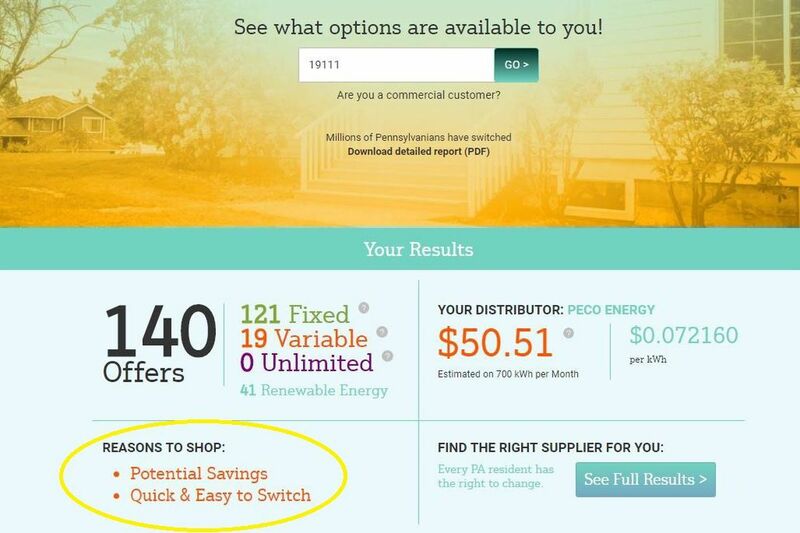 The Inquirer reported last month that the commission's electricity-shopping website, papowerswitch.com, was promoting a potential 44 percent annual customer savings based on one supplier's three-month rate offer. The unrealistic savings did not take into account a $145 enrollment fee the supplier charged, nor the fact that the supplier's very low rate was only guaranteed for three months. In November, the PUC’s website said Peco customers could save up to 44 percent, an unrealistic amount that did not include a supplier’s steep enrollment fee. The PUC has subsequently revised the website. Since then, the commission has revised its website so that it no longer promotes potential savings based on a specific offer. Rather, the new language simply states that customers might realize unspecified "potential savings" by switching to competitive suppliers. According to the PUC's website, 63 suppliers have posted 140 offers for Peco residential customers, including several that genuinely offer savings over the utility's current price. The best offer for a 12-month fixed-rate supply with no monthly fees is more than 15 percent less than Peco's price-to-compare, the rate charged to customers who don't shop around. The website's changes, and the PUC's exploration of potential new disclosure rules, highlight the challenges that consumers face navigating competitive electricity markets, in which some suppliers assess additional fees that are not reflected in the kilowatt-hour price and other suppliers offer additional services beyond the electricity itself. "The retail electric market continues to evolve," said Gladys M. Brown, the PUC's chair. "As this happens, so too must commission regulations evolve." The question of comparison shopping becomes even more complicated if suppliers begin offering time-of-use rates, where the price may be lower or higher at different hours and the potential savings depend on how much usage an individual customer can shift to off-peak periods. "In instances like these, is it even appropriate to express prices in cents per kilowatt hour?" asked Andrew Place, the commission's vice chairman. Suppliers are now required to notify customers about two months before their fixed-term contracts expire. Many customers find it is more advantageous to switch suppliers than to accept their current suppliers' new offer. "This proposed revision is in response to consumers who object to having an ETF [early termination fee] assessed upon them simply because they acted on the expiration notices sent by the supplier," said Place.